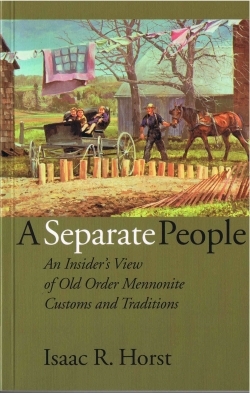 We have 3 winners today of Isaac Horst’s A Separate People: An Insider’s View of Old Order Mennonite Customs and Traditions. If you missed the original interview with Isaac’s son Osiah, you can find it here: Osiah Horst on Old Order Mennonites. We’ve also got an excerpt from the book to share with you today. Congratulations, and please send the address where you’d like your book shipped to Osiah at obhorst@mwpol.ca. Cobden, Ontario, Canada K0J 1K0. The answer lies in our age-old social pattern. When we have no services in the home community, we attend church in another community. After the service, we have dinner in one of the homes, then spend the afternoon in fellowship or just plain visiting. Usually we go home at about 4:30, in time to do the chores. Those currently milking usually go home earlier. Occasionally we have supper at a second home, if the young people do our chores. This pattern is entirely different from that practiced among Old Order Mennonites across the border. Among them, all visiting is by invitation. At those meetinghouses shared with the Horning church, they meet on alternate Sundays only. Yet they would never consider visiting a home in another community without an invitation. To us, the advantages of this system far outweigh the disadvantages. Not the least is the surprise element of not knowing whom to expect. The hospitality shown by the hosts and the warm fellowship with others–both are very rewarding. By visiting in other communities alternatively, we maintain a close fellowship with all the other communities. One of the greatest advantages of this system is the automatic exchange among the ministers. We have visiting “evangelists” almost every Sunday. Because services rotate among the various communities, the ministers likewise rotate. We never know who will be preaching before we arrive at the meetinghouse. We are ready to agree that variety is the spice of life. In Ephesians 4:11, we read that Christ gave some to be apostles, some prophets, some evangelists, others pastors, and still others as teachers. In 1 Corinthians 12:4-11, we read of diversity of gifts. We can endorse that. Since no two of our ministers are the same, we have this diversity at our disposal. Some of them are more inclined to be evangelists, others pastors, and still others, teachers. This gives us a vast scope in the administration of God’s Word. If only we would make better use of this advantage! Everything you say is true. I find it hard to explain, myself. The best answer I can give is that it shows how extremely high we value our rotating meetings, and our social system. If it helps to strengthen the bonds of love and fellowship, who can put a price tag on that? There is another angle to consider. Even though we are frugal and all that, we are also very slow to change. This system is so deeply ingrained that no one gives a thought to the foolishness, financially. Yes. Sometimes it happens that one minister is alone. It does not spell a hardship, as far as the congregation is concerned. Yet one can tell that the minister feels rather burdened, to carry the load alone. They might give a longer testimony than usual near the end of the service, but that’s about all. It would indeed be permissible for them to speak longer. But again, doing so would mean a change from the normal custom. Yes, at least for as long as they are able to carry out their duties, depending on their age and health. When they are replaced they still exercise their office as much as health allows. I am quite pleased to say the least. Congratulations to all the winners. I also, would like a copy of that book-even though I didn’t win. LOL Really, I have friends who are Old Order Mennonite and I would really like to read the book. I am excited to read this book! Back in the early 1980’s my great-grandmother was in poor health and the local Mennonite women would come to her farm and help care for her. I always thought this was pretty neat as this allowed her to stay in her house and not in a nursing home. Not sure if this is something that Mennonite’s do in other regions but I have always wanted to learn more about them. Congratulations to all the winners! I look forward to these contests. This is one more title to add to my “bucket list” of books to read…so little time, so many books! Happy for all the winners, enjoy. I am very happy for the winners and enjoyed reading the excerpt from the book. Thanks to Osiah for taking the time to give us more insight into Old Order and Conservative Mennonites, and sharing some of his father’s work with us. I was just reading through a bibliography of Isaac Horst’s work and it sounds like he has quite an interesting catalog. So if you end up liking A Separate People, there looks to be a good bit more from Mr. Horst. And also, thanks to all who entered and shared their experiences and questions. Really enjoyed it.